Could the EU force us to accept TTIP? I wrote recently about the high volume of mail which we MEPs are receiving from concerned citizens about TTIP (the proposed Transatlantic Trade & Investment Partnership), and I expressed the view that their concerns were premature, because we don’t yet know what the Treaty – if it is ever agreed – will say. Most commentators believe it will be years, not months, before we have a final text, and that will be the time to decide whether the benefits outweigh any disadvantages, and whether to vote for or against. But I recognise that the concerns expressed are genuine, and I am struck by the way that most specific concerns relate straight back to the broader worries that many people feel about the EU as a whole. The anti-TTIP campaign may be motivated by protectionism and anti-Americanism, but it has some genuine points — the NHS, ISDS, the dangers of empowering large multinational corporations, and the secrecy surrounding the negotiations. Let’s think them through. NHS: We’ve been assured by just about everybody on this side of the Atlantic that the British NHS will be protected. If the UK was negotiating directly with the US, you can bet that the NHS would be at the top of the minds of British negotiators. But for the EU, it’s merely one issue for one out of twenty-eight member-states. Important, yes, but just part of the negotiating furniture to be horse-traded between the parties. Indeed this gives the lie to those who say that with the strength of the EU’s size and numbers, we can negotiate much more favourable trade deals than by going it alone. Exactly the reverse is true. EU negotiators are in the unenviable position of having to trade-off the conflicting concerns of 28 EU member-states, before they even start trying to accommodate the negotiating position of the other side. Far from adding strength, this structural conflict critically weakens the EU position. We’d be much better off with a bilateral deal (and but for our EU membership, we’d probably have had one decades ago). ISDS, the influence of multinationals, and lack of transparency: Opponents of TTIP fear that ISDS, the Investor/State Dispute Settlement régime, will unduly empower multinationals, and enable them to “ride roughshod over the democratic decisions of member-states”. I think that concern is overdone – after all, ISDS has been a commonplace of free trade agreements for years, and if properly drafted shouldn’t be a problem. But there is a much broader issue of the willingness of the European Commission to listen to large companies. Multinationals keep hundreds – perhaps thousands – of lobbyists in Brussels, and they wouldn’t carry that cost if they didn’t think it would deliver. There is a curious symbiosis between large corporations and the EU. The corporations need to influence the Commission, and to do this effectively, they have to sing the Commission’s tune – especially in two key areas. This is why big companies support (publicly at least) EU integration, and oppose Brexit. And this is why they support the orthodoxy on climate change. More than once I’ve heard spokesmen for big-name companies talking publicly about the importance of fighting climate change. But catch them afterwards over a beer, and it’s “Well Roger, you understand why we have to toe the corporate line in public, but my own view is quite different….”. This symbiosis (or at least convergence of interests) is also driven by the consensus on regulation. European Bureaucrats love regulation — it’s what drives their careers, pads out their CVs and justifies their posts. Multinationals love regulation because they’re big enough to cope with the costs, while the regulatory thicket acts as a major barrier to small companies, start-ups and new businesses. It’s a barrier to entry. So both the Commission and the corporations love heavy-handed regulation, even though it damages the wider economy. This is one of my key concerns with TTIP. As I have written before, tariffs on manufactured goods are already low, and TTIP’s benefits are therefore likely to come from non-tariff barriers, which implies regulatory convergence. But regulatory convergence is a two-edged sword. Of course it’s daft that the same corporation needs to prepare its accounts on two separate bases to satisfy both European and American rules, and it would increase efficiency if we had common standards. If regulatory convergence is accompanied by a determination to minimise the regulatory burden, well and good. But the danger is that every player wants to put his own bauble on the tree, and you end up with a dog’s breakfast. Some opponents of TTIP argue that regulatory competition has its benefits too. I will certainly want to satisfy myself on this point, and to be convinced that benefits out-weigh costs, before deciding how to vote on the final package. As for lack of transparency — well that’s what the EU does best. It has thousands of specialist committees meeting behind closed doors and determining policy (don’t imagine for a moment that the European parliament makes the rules). So I hope that one point is crystal clear — for those with serious concerns about TTIP, the EU, and our membership of it, is part of the problem, not part of the solution. While in theory trade deals have to be ratified by each member-state, in practical terms there are huge pressures on every member-state to toe the line, and as EU members we may be forced to accept a TTIP deal that isn’t right for Britain. If you’re worried about TTIP, be sure to vote “Out” in the Referendum — and we’ll maybe get the bilateral UK/US trade deal that we should have had years ago. 21 Responses to Could the EU force us to accept TTIP? That sounds better, I’m concerned that Corporate organisations are being granted permission to sue Countries who try to break away from International Control. Little point in jumping out of the EU frying pan into a Global fire. They can only sue if the signatories break the terms of the deal. You have to have some mechanism for redress in the event of non-compliance — or what is the purpose of the Treaty in the first place? If the EU is to “SPEAK” for ALL its Member States presently TRAPPED in the European Union on all matters of TRADE to the mighty USA, there is absolutely no point in having ANYONE in those two Houses of Parliament if they cannot “SPEAK” for all British Citizens themselves. I know you absolutely hate this but the eu, UN, WTO, TTIP, UNECE, Global vehicle standardisation, GMO et al have all evolved into corporate facilitation entities and it's corporate inspired fear that is going to prevent us leaving the eu. Politicians think they're all over the game or like to infer they are, they're not, in the big scheme they don't even know what the game is. Those that have figured it out and do, in the main, are complicit with it. It's a power game and like it or not politicians are not in possession of the power. You can't extinguish a candle by huffing at the light bulb, in order to address an enemy you have to recognise it, that enemy is corporatism. It should serve the world not drive it. As long as the people continue to VOTE and PAY British Politicians that want to remain in the EU-FOREVER-that is where ALL IN THIS COUNTRY WILL REMAIN-allowing foreigners to govern ALL in these British Islands-yes, forever. So many brave people gave their lives for us-and even for those that we elect to Govern us by and through our very own Constitution. How many times are we going to be tricked into remain in the now European Union? What happened the one and only time British people had a REFERENDUM on the EU in 1975 when you were all told that if you voted to remain IN the then EEC there would indeed be “no loss of essential Sovereignty”. Just look at us NOW all through voting for one of those three major Political Parties that want to remain in the now EU forever. If any of you do not believe we will have a true and fair REFERENDUM why did you vote for any one of the THREE major Political Parties again, that truly want to remain in the EU-forever? Will the EU take the view that in voting for those major three again and filling that House of Commons with them, that it is a clear indication that being a member of the EU is a voluntary act? Why oh why did you place your cross by any of those three? So many died for our FREEDOM, our freedom to Govern this Country according to our very own Common Law Constitution. The promised REFERENDUM may well be the only chance we have to set ourselves FREE from the EU. Roger Helmer knows well that the EU plans well ahead too, see THE FUTURE “EU 2020” STRATEGY etc, etc. Illustrates the point well! The EU will I expect sign on our behalf, I just hope on our own we would exercise more care. What a Government does must be beyond reproach, and beyond foreigners control. What happened to the law that an outgoing regime was not able to tie a newly elected parliament to its policies? 14That our oxen may be strong to labor; that there be no breaking in, nor going out; that there be no outcry in our streets. “Back me or I will sack you!” says the PM. Is this what our ‘democracy’ has sunk to ??????? What is the point of free elections ?????? Non, democracy has been an illusion for probably the whole of my life, now it’s getting very blatant. 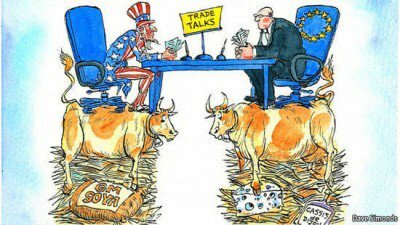 Further to these debates regarding TTIP, and the EU speaking for all its Member States (forever) to the USA on ALL matters of trade. And while our attention is on this particular takeover of what once National Governments used to do, this matter is going on through-our the World. Take, for instance, http://insidestory.org.au/philip-morris-australia-and-the-fate-of-europes-trade-talks/ and if this is going on in other Countries, why not our own Country and all the once FREE Country’s in the EU, which I would agree to right away to, especially noting that there is absolutely no point in having ANYONE in our Houses of Parliament if foreigners are going to “SPEAK” for all of us here in the once truly GREAT United Kingdom of Great Britain and Northern Ireland. What is the point in voting for or paying national MP’s when they can no longer Govern us? And to think, people my age were in a WAR SO THAT WE COULD INDEED SPEAK FOR OURSELVES AND GOVERN OURSELVES-ALL ACCORDING TO LAW. And this is what a Professor of Law came up with. How easy it is to influence the weak and I think there exists a lot of them! Delete – would. Insert – could, maybe, might, possibly. As in Climate BS…. and the Atlantic Multidecadel Oscillation has caused fast and cold winds here in the W. Mids for quite some weeks. Should keep the fiddled data average down a bit? So its just about money and how fast you can accumulate it. Not forgetting its more and to be very fast. Currently that collection process is being sped up for the advantage of a few. Everything else about it is simply contempt. I suspect having a second home in Europe will attract some added tax…as in Greece. Well, somebody has to pay their debts. Bolt on some meter data decoder for each type…quickly now. Or don’t switch to save a couple of quid? Here is a cut and past of his take of TPP which it seems is being forced through by devious tricks bypassing the Senate. To answer the important Question re TTIP-Exactly what is it?. The TTIP is a Partnership=what ever that means. However it is allowing the EU to SPEAK for ALL its member states on matter of trade-ALL kinds of TRADE?? Do you know exactly what they mean? Such as more Battleships etc ‘planes? Or just simply booring food? Food from Ameica content re GMO’s? By the time National Governments “catch on” that is presently happening-others are doing the job each Government should be doing- the people that vote for them and pay them, might realise that there is no need for National Governments any more!! I wish eh! Crap american TV programs for one. I don’t knowingly buy anything of USA origin unless perhaps it originated in China. Blossom Hill wine…there, thats one other! So I guess most of it is Services and a few planes? VI interests mainly! It is ‘proposed’ at the moment, and we shall eventually see the out-come of it, no doubt. There are many answers need to the questions put. But a GREAT many more questions need to be put to your MP’s-ask them about it and ask why has the EU as a whole to do ‘the trade” when we have our own Governments with not enough work to do-to keep that occupied, etc. What is the point in having a National Government that can no longer GOVERN etc. Will they be needed in the future, especially now Mr Cameron has set up the REGIONS of the EU. Saw you in the Breitbart video of the today’s mass handclap. Well done.